Is it Time to be Brave with Your Colour Palette? The colour you choose to represent your brand’s message is just as important as the message itself. The most successful brands tend to be recognisable with just a flash of colour, but selecting a colour for a brand identity isn’t as simple as just picking a colour that looks nice. Behind the brands we know and love is a complex psychological design process, and this process is perhaps the reason why we know and love them. Utilising this colour theory for your brand might be simpler than you think if you go back to basics and consider what you want your brand to say and therefore which colour best represents this. For instance, you may choose to use a bold orange if your brand is creative, motivated and approachable, but you may choose to avoid orange if your brand is more akin to a strong, corporate brand. In which case, a deep blue may be more appropriate. Clearly, choosing the right colour can make or break your brand’s identity as selecting the wrong colour palette can create conflicting messages. However, selecting your brand’s colour shouldn’t start and end with investigating the psychology behind colour. 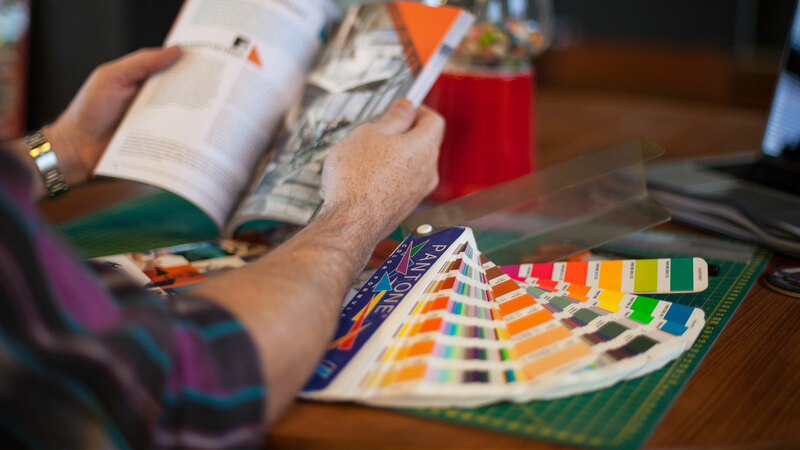 Looking at trends and other brand colours is just as essential within the design process. It might pay to take note of colour trends, but be aware that trends don’t last forever – choosing a bold pink because it’s the Pantone Colour of the Year for 2014 might not keep your brand on trend with the following year. By 2017, “Radiant Orchid” is no longer the trendy colour it once was. However, you do need to keep your brand trendy and this may mean keeping an eye on colours that are modern but that are also timeless. Being brave with your colour palette may make a statement so introducing bold hues may be a consideration if it fits with your brand identity but perhaps consider combining the bold colour with some neutral tones to keep your identity grounded. Spotify recently introduced a brave purple hue to their website branding – a stark contrast to the original green. This change instantly modernised the entire brand, but by selecting a dark grey for their other colour, they were able to maintain the original brand identity and message. It can be useful to take inspiration from existing brands but an absolute must is that you keep your brand identity original. Selecting red and yellow because it works for McDonald’s certainly doesn’t mean it will work for your brand, but you may equally want to consider that there may be a reason why McDonald’s didn’t choose neon pink and green for their logo. Being brave with your colour palette doesn’t quite mean you should use neon pink and green without careful consideration! If you want to be brave and experiment with your colour palette, why not try out this handy tool we discovered and let us know your favourite colour combos!